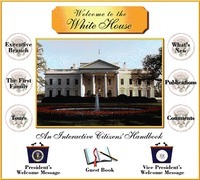 Version 1 is representative of the Clinton Administration's first White House web site. The information contained within this snap shot is as it existed in November 1995. “Clinton Administration Website Version 1,” Clinton Digital Library, accessed April 24, 2019, https://clinton.presidentiallibraries.us/items/show/2580.